I missed the first Cloud9 Blog Hob because we were on trip, so I am very happy to play along this month with the sketch challenge. I used Mother`s Day Bouquet and Fair Isle Background WPlus9 stamp sets. I had hard time to incorporate the rectangle and I was finaly happy with the circle shape. The sentiment is saying `For you`. Thanks for stopping by. WPlus9 ima celo paleto motivov, ki so mi zelo všeč. Nekaj jih imam tudi jaz in odločila sem se sodelovati na tokratnem izzivu s skico na blogu Cloud9. Kvadrat sem zamenjala za krog, vsega ostalega pa sem se kar držala. Želim vam prijetno soboto in hvala za obisk. Nadvse zanimiva in seveda zelo lepa. Všeč mi je izsekan krog, ki ga malo manjka. Čisto drugače kot če bi bil izsek na sredini voščilnice. Tudi tisti šivi na zgornjem levem robu so nekaj posebnega. Čeprav še nimam nobenih njihovih štampiljk, pa so tudi meni njihovi motivi zelo všeč in enkrat si bom nabavila kakšen set. Ti si čudovito tole skombinirala. This is beautiful! I love how you interpreted the sketch! Love the gorgeous red flowers with the soft blue! Fabulous take on this month's sketch! Gorgeous creation! Your red blooms just pop off the card. Your card is fabulous! Very pretty color choices with a nice die cut circle where you placed the flower, strips and sentiment. Wonderful design. P.S. Thank you so much for stopping by my blog and leaving such a nice comment. Hi Tina! What an awesome card! There's so much that I love about this - the layered banners and stamping, the colors, the circle window...beautiful! So happy that you could join us for the Cloud9 Hop! Thank you! This is a beautiful card, Tina! I love the bright pop of red among the white and blue. So glad you joined us for this month's Cloud9 Blog Hop! 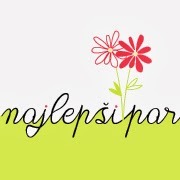 I love the negative circle you used in your design--it is the perfect backdrop to those beautiful flowers. Wonderful job with the sketch, Tina! 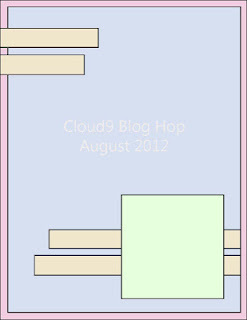 Thanks for joining in this month's Cloud9 Blog Hop!